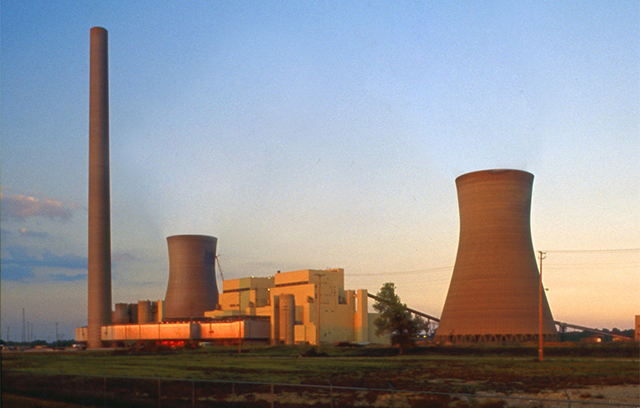 Indiana Michigan Power Company’s Rockport Plant Unit 1 in Rockport, Ind., was placed in operation Dec. 10, 1984. Thirty years ago — Dec. 10, 1984 — Indiana Michigan Power Company’s Rockport Unit 1 became operational. At that time, Rockport made its contribution to the advancement of electricity generation technology with the first installation of temporary turbine fast valving controls for both control and intercept valves. Rockport Plant employees and retirees gathered in September to take advantage of the beautiful autumn weather for an early anniversary celebration. “A common theme during discussions over lunch were: ‘Has it really been 30 years?’ – followed very quickly by, ‘But we don’t look any older, right? '” said Judy Butcher, Rockport Plant administrator. A second unit was added to the plant in 1989 and today each unit produces 1,300 megawatts of power — 2,600 megawatts total. The Rockport site, located some distance outside of the AEP service territory, was selected because of its special suitability with respect to water supply, the receipt of coal via river barge and the relative ease of integrating the plant into the AEP System’s existing extra-high-voltage transmission network. Over 230 employees and contractors work at Rockport and that number has swelled to over 680 with the installation of dry sorbent injection (DSI) technology which is used to reduce sulfur dioxide (SO2) emissions. “Rockport has been a backbone to providing our customers with reliable electricity. I am very thankful for every employee and contractor who has worked at the plant over the last 30 years. Your dedication to keeping the lights on is apparent each and every day,” said Paul Chodak, Indiana Michigan Power president and chief operating officer.